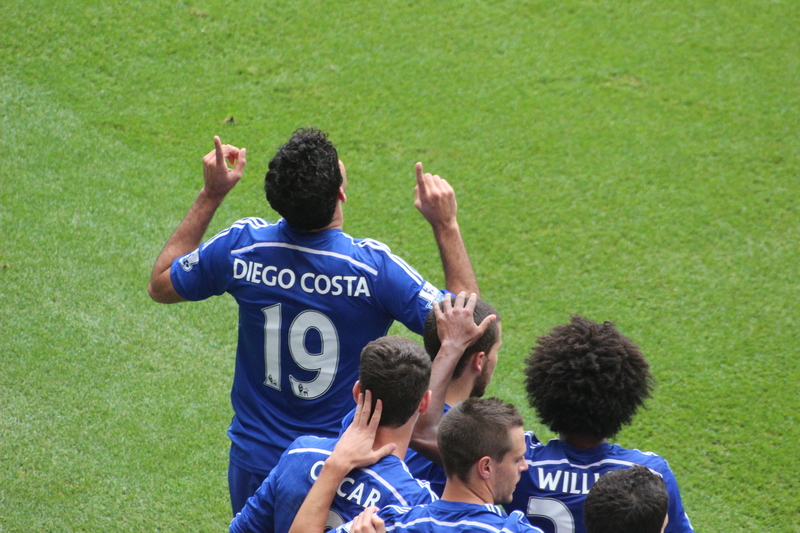 Chelsea vs. Aston Villa : 27 September 2014. I didn’t go to the Capital One Cup tie with Bolton Wanderers on Wednesday. This was only the fourth time in almost ten years that I had not been present for a Chelsea home game. However, this one was a little different; for the other three, there were extenuating circumstances (Celtic friendly in 2006 – I was on holiday in the US, Arsenal league in 2013 – snowbound, Hull City league in 2013 – my mother was in ill) but this was the first time since a League Cup game against West Ham United in the autumn of 2004, that I had chosen not to attend a first team game at Stamford Bridge. Instead, I watched on my laptop at home and the experience was, not surprisingly, odd. I felt quite distanced from the proceedings to be honest. When I attend in person, I get totally wrapped up in the game. On Wednesday, save for a little exultation and a small fist pump when Oscar carefully placed the winner inside the Bolton goal, I watched in bored silence. Bolton hardly attacked us and the shots rained in on their goal. It didn’t seem like a proper game of football. With my good friend Alan also absent – he was in Albufeira with his good lady – Stamford Bridge was without the two of us for the first time in years and years. Don’t worry, this won’t too often – I hope – in either the near or distant future. I am, however, not attending the Maribor game either. Why? The main reason is a change in working hours which means I need to be awake at 5.45am each day. On these midweek games, I rarely get to sleep before 2am. Do the maths. On Friday, I left work with a smile on my face. After an arduous few weeks, I was off for six whole days, with the highlights undoubtedly being Chelsea games in London and Lisbon. Although I knew that there would be a lot of painful “catching up” to attend to on my return to work, all I could think of was my six days’ away from the daily grind. I then realised that four of these would be spent in the company of Lord Parky. Bless him, I can’t be too harsh. This will be His Lordship’s first “European Away” since Stockholm in 1998, and the old fool has been buzzing the past few days. At last there will be new stories from Europe for him to regale us with for the next few – er – decades. We’ll all be staying in the same hotel in Lisbon. To see Lord Parky at the bar, downing some Super Bock, will surely be a highlight of this season. Some faces rolled up – Dave, then Rob, then Woody and Seb, then Andy, then Chris and Nick. The Peroni was hitting several spots. At around 2.15pm, Cons arrived, a little the worse for wear after a night out on Friday, but happy to be attending another Chelsea home game. I first met Cons in the spring of last year when she was in London to attend interviews at various colleges. Originally from the Detroit area, she had since enjoyed a year at college in The Smoke and had just attained her Master’s Degree on Friday; hence the hangover. What better way to celebrate than with a Chelsea game. Her last match was the friendly with Inter in Indianapolis last summer. It was good to see her. Meanwhile, PD was turning purple and almost exploding after several minutes of gut-busting laughter with Lord Parky and Dave the Hat. On the way up in the car, PD and I had spoken briefly about the upcoming game at Shrewsbury in the Capital One Cup. We touched on the days when our club used to play the likes Shrewsbury in the old second division and it triggered some memories of attending football back in our youth; the raw pleasure of independence, not long out of school, meeting up with mates, dressing in the correct manner, making sure your trainers were clean and your polo shirt ironed, the pre-batch revelry, the uncertainty of not knowing the result, the added uncertainty of not knowing if you might encounter some rough-and-tumble during the day, the sense of camaraderie, the thrill of a day on the edge. In an instant I was transported back to a different age. Coming in by train, stepping out on to a platform in a foreign town, and joining in the rush to get to the ground unharmed, along with hundreds of similar followers of fashion and football – a mix of surly youths intent on trouble, but also a heavy presence of normal lads overdosing on Pringle pullovers, wedge haircuts, Diadora Elite trainers, Sergio Tacchini tracksuit tops and Lois jumbo cords – and a rush of adrenalin and a sense of danger. Following the team. The warm feeling that you got when you followed a club in the second division with a massive away following through thick and thin, while your school mates who followed the more popular teams hardly ever went to see their lot play. We were like some unknown army, existing below the radar, carving out reputations. They were magical times for me. With the time quickly passing, there was a massive roar inside The Goose when Everton bagged a late equaliser against Liverpool. On the walk down to Stamford Bridge, it was still humid and muggy. At the Matthew Harding, one of the five turnstiles was not working and so PD, Cons and I were delayed getting to our seat. We missed the first five minutes. I quickly settled and glanced at the eleven players down on the pitch; again, the nine ever-presents, this time supplemented by Willian and Oscar. Lo and behold, our first attack yielded dividends. Branislav Ivanovic played a fantastic ball through to Willian, whose shot rebounded back to him. He had the presence of mind to lay the ball back to Oscar who swept the ball in, low, past Guzan. Cons and I turned to each other and yelped. How nice of the team to wait until we were inside the stadium before they opened the scoring. I had been reliably informed by a Villa-supporting work colleague that they had only enjoyed around 32% possession in their games so far this season. The play for the rest of the half backed-up this fact. We had tons and tons of possession as we moved the ball across all areas of the pitch and tried to expose gaps in the Villa defence. Over in the far corner, the Villa support were berating us. It has come to my attention that your supporters believe that the backing given to Chelsea by its supporters is rather lack-lustre. May I remind you that away teams are entitled to three-thousand tickets at Stamford Bridge. Until your supporters bring that full amount to Chelsea Football Club may I suggest that they wind their collective necks in. With Cesc Fabregas instrumental in our attacking endeavours – one slide rule pass to Brana had us all purring – we continually moved the ball well. Our chances started to stack up with only rare attacks from the away team. It seemed that every Chelsea shot ended up in the Shed Upper. As the first-half came to a close, the Stamford Bridge crowd became quieter and quieter. We were desperate for a second goal to kill the game off, calm our nerves and also re-energise the support. At half-time, Neil began to introduce the half-time guest player with a few clues about his time at Stamford Bridge. I had an idea straight away, but the big clue was that he played right-back in Athens in 1971. Yes, it was Johnny Boyle, our under-appreciated Jack-of-all-trades from our early ‘seventies pomp. As he walked around the pitch with Neil, I realised that he is sadly overlooked when supporters look back on that lovely period in our history. He often used to play in times of injury to others and he was often named as substitute. I never saw him play. Whereas others in that vaunted team were household names, Johnny Boyle would forever be the Private Sponge of the early ‘seventies Chelsea team – just outside the main troupe, with few speaking parts – leaving others to take on the roles of Captain Mainwaring, Sergeant Wilson, Corporal Jones, Godfrey, Pike, Walker and Frazer. A few chances were exchanged in the second half and Diego Costa came close. Eden Hazard, possibly showing off – not sure if Mourihno approved at just 1-0, but I’ll forgive him – attempted a lovely rabona. Soon after, a delightful passage of play involving several players set up a pinpoint cross from Dave which Diego Costa headed powerfully past – or rather through – Guzan. That was the second goal that we so needed. It was time to relax a little. Oscar almost nabbed a second, while yet more sublime trickery from Hazard resulted in a whipped cross which narrowly avoided Deigo Costa’s stoop. With an eye on Lisbon, Mourinho soon took off Hazard. I was hoping for Drogba to replace Diego Costa, just so that he could shadow Senderos for twenty minutes and try to turn him into a quivering wreck. To be honest, I was surprised that Jose left Diego Costa on until late. On eighty minutes, however, a strong run by our new golden scorer, involving a sublime dummy, resulted in a shot being blasted at the Villa ‘keeper. The rebound fell nicely for Willian who bundled the ball in from very close range. It capped a great all round performance by Diego Costa, who now has eight goals in six games. So, 3-0 and an easy win. At the final whistle, many of the Villa fans had begun their journey home. I was obviously pleased with this result, ahead of a potentially awkward game on Tuesday. There were no injuries and our team continues to gel. A clean sheet was an added bonus and I hoped that the quite ridiculous noise among certain sections of our support doubting Courtois’ capabilities would quieten. A defence lets in goals, not just a goalkeeper. Sixteen points out of eighteen – and a full nine points ahead of Liverpool, for example – and an excursion to Portugal on Monday ahead of our game against Sporting Lisbon on Tuesday. I suppose that these are the most magical times of all. This entry was posted in Season 2014-2015 and tagged 2014-2015, Aston Villa, Diego Costa, John Boyle, Lisbon by Chris Axon. Bookmark the permalink. Weird this…over the past few years…for a couple of reasons, one of my favorite squads to hand it to is Villa. Their own fault. They created my despise for them. Excellent write up as always. Glad Senorita Cons could wach her Oscar score finally.